​​Students should be able to read and write English at the level required to perform the work in the qualification/unit of competency. A1 Group Training’s trainer will provide all participants with a Language, Literacy and Numeracy assessment on enrolment and will provide participants with the necessary referral for support if required. Participants must provide their own personal protective equipment (PPE) and A1 Group Training will provide all learning material on enrolment. Students must have access to all workplace documents such as safety and emergency plans and safe work method statements (SWMS) to successfully complete the courses offered. This unit requires the operator to be able plan the work, conduct routine checks on the forklift, shift loads in a safe manner, and shut down and secure the equipment after the completion of operations. This unit is based on the National Standard for Licensing Persons Performing High Risk Work. This unit in its current form meets state and territory licensing requirements. Any alteration will result in a unit which is not acceptable to regulators for the purpose of licensing. This unit specifies the skills and knowledge required to operate a forklift truck safely. Forklift truck means a powered industrial truck equipped with lifting media made up of a mast and an elevating load carriage to which is attached a pair of fork arms or other arms that can be raised 900 mm or more above the ground, but does not include a pedestrian-operated truck or a pallet truck. A person performing this work is required to hold a forklift truck high risk work (HRW) licence. This unit requires a person operating a forklift truck to plan the work, conduct routine checks on a forklift truck, shift loads in a safe manner, and safely shut down and secure equipment after completing operations. 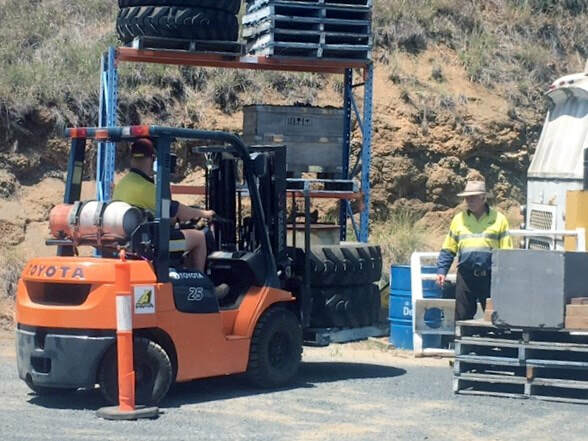 ​The forklift licence is available by first completing knowledge training then doing work experience under a qualified licences supervisor. You must log all work completed on the forklift in your log book. The assessor must check and verify the workplace training prior to you completing the final assessment. Successful applicants may then apply to WH&S Queensland for the licence. Clicking the link will open a new tab in your browser. To return to this page close the browser tab. ​This covers the cost of the training and assessment of the unit of competency. A high risk licence application fee is also applicable for successful participants.